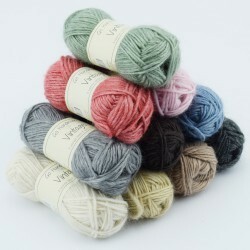 Yarn made from bamboo fibre is a popular soft yarn. It can be used for many different crocheting and knitting projects, since it is super versatile. Besides from being very usable, it is also sustainable, which does not make it any less amazing. 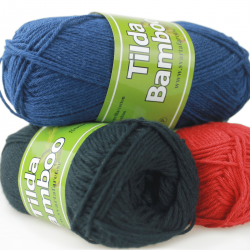 In contrast to for example alpaca and sheep wool, that are both animal fibre, bamboo yarn is extracted from plant fibres, which is much more environmentally friendly. Not many manufacturers make a yarn from 100 % bamboo fibre, as that may have some disadvantages. For this reason, our bamboo yarn has been mixed with cotton and acrylic, resulting in a very attractive yarn for knitting and crocheting. The bamboo yarn has become increasingly more popular, because it offers some other qualities than the traditional types of yarn being sustainable. For this exact reason, bamboo yarn is also highly suitable for people who are allergic to synthetic fibres or wool - moreover, bamboo yarn is a natural material which holds antibacterial qualities and is healthy for the skin. 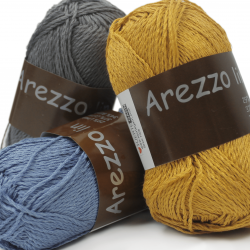 Bamboo yarn is an excellent choice for a variety of crocheting and knitting projects, seen as it is both very durable and breathable, making it very suitable for socks, jumpers and shawls alike. The most common use of the bamboo yarn, however, is for socks, since it is mixed with acrylic fibre, which is equality very hardwearing. This way you get the best of both worlds. Other projects for your home would also make a perfect match for the bamboo yarn, for example towels, dishcloths, and afghans. One thing is certain - when you work with bamboo yarn you are sure to get an end result that is both comfortable and durable. In our shop, you can get the bamboo yarn in a variety of lovely shades that can easily be combined with other just as lovely shades. 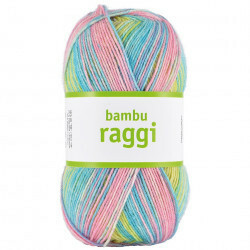 You can choose our Järbo Soft Raggi yarn, which consists of many colours in the same ball of yarn. This can give your products a very unique and special look. 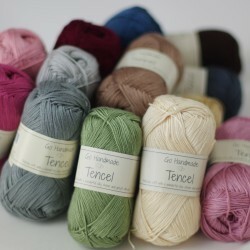 Here at Hobbii.com we want to be among the best and fastest in terms of delivery of bamboo yarn and yarn accessories. Which is why you will always receive your order within three working days of placing your order online. We take pride in our high level of customer services, and you are always welcome to give us a call, if you have any questions about any of our products. You always have the right to return any order placed at our webshop. Please do not hesitate to contact us, if you have questions regarding our bamboo yarn or if you need help placing an order. You can reach us by filling out the contact form, and we will get back to you as soon as possible. You call also call us at tel.no. +45 31 86 33 57 or email us at support@hobbii.com. We look forward to welcoming you as a customer in our shop. This is some of the softest yarn I have ever felt. So buttery and smooth textured. I am so excited for the crocheted top I have planned for it. 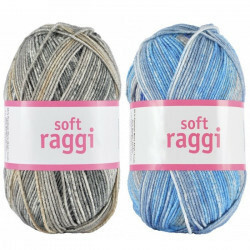 As the name suggests, this yarn is SOFT! Making a baby sweater for a newborn and it is a joy to work with. Will buy again, and again, and again.